Lipstick and Lemondrops: Foodie PenPals - Reveal Day! Foodie PenPals - Reveal Day! 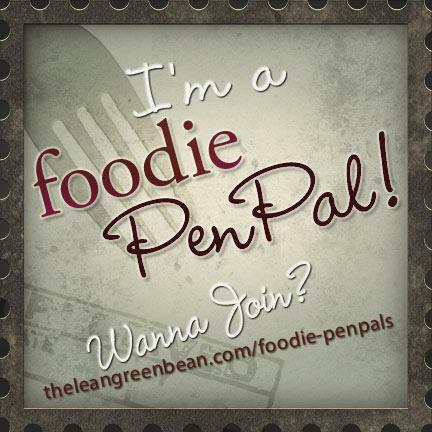 I'm so excited to be participating in May's Foodie Pen Pals! I mean, who doesn't love to get presents in the mail? Food presents no less. This is my first month participating and I can't say enough about how much I loved it. Not only do you get some yummy goodies in the mail but you get to meet some pretty cool people as well. Thanks to Lindsay over at The Lean Green Bean for hosting. This month I was paired up with Marissa and Vicky. I sent Marissa a package and Vicky sent me one. Marissa is a reader from Edmonton, Alberta currently working towards a Bachelor's Degree in Marketing. I must say that I had so much fun shopping for Marissa. Vicky is a blogger at menubyvicky. If you haven't visited her blog yet you must check it out... when you're done here, of course! Ha. 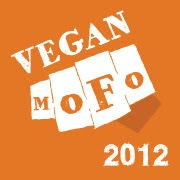 Vicky has some super yummy recipes (a few that I plan on veganizing!) and she's pretty funny too! Anyway, onto the yummy goodies! It was like Christmas morning when I finally received my package! Bumble Bar! I've always wanted to try these but never got around to buying them. I opened the Hazelnut one to try and it's pretty good! Not what I expected but I liked it. Cashews! I usually only eat RAW cashews but I was so excited to see this in the package. I tried these later on and all I can say is OMG! These are unbelievable. I had to stop myself from eating the whole bag in one go! I love that she sent me some seeds to grow my own fresh herbs! I cannot wait to plant these on the weekend. I really liked the write-up on the bottom of the Sage packet: "Sun loving kitchen herb whose purple flowers attract hummingbirds." I hope I attract some hummingbirds by my kitchen window! This was the first thing I opened when I recieved my package. I was so intrigued by the name - Buckwheat Snack - I just had to try it right away! Umm... it was totally yummy! Sweet and chewy and full of nutritional goodness! I am definitely going to be on the look out for this the next time I'm at the store! After sampling some of the goodies it was time to put them away so that I wouldn't go crazy and eat everything in one go! Hopefully this cupcake cookie jar will do it's job and keep these goodies away from me! There you have it - my Foodie Pen Pal treats. Thank you so much Vicky! 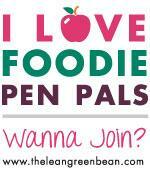 - Foodie Penpals is open to US, Canadian residents & UK residents. Please note, Canadian Residents will be paired with other Canadians only. We’ve determined things might get too slow and backed up if we’re trying to send foods through customs across the border from US to Canada and vice versa. So, I’m going to keep two separate lists and match US w/ US and Canada w/ Canada! ***If you’re in Europe, please contact Carol Anne from This Is Rock Salt at rocksalt@thisisrocksalt.com to get involved! kind of obsessed with your cookie jar! also wanna try those bumble bars! Thanks, I'm obsessed with it too! Ha. Today I took the other Bumble Bar (Cherry Chocolate) to work with me and oh my goodness it was so good! I liked it better than the Hazelnut. I have never heard of Bumble Bar. But now I am interested and would love to try one. The cherry chocolate one is really yummy! Looks like some awesome treats! I also received buckwheat snacks. Mine were a ginger flavour! Definitely a fun snack. I love your cupcake jar. Wow you got some fun food! And the cupcake jar is so cute! I am in LOVE with that cupcake cookie jar. That is the cutest thing ever! !